I stood by them one day, but I regret my decision today. What seemed like a ray of hope leaves me with only despair today! That spoken truth & those ideologies for change, are now being kicked far away and unmindfully being compromised. Those high principals that resonated in their voices and seemed their very foundation, have shaken and crumpled down today. With their irresponsible actions they have proved that they are no Heroes. Like I had thought and many others like me did too, who stood shoulder to shoulder in their fight against corruption. Most of those ‘real’ leaders of the IAC movement such as Sri Sri, Anna ji, Kiran Bedi ji and others, no longer stand with them today. May be because these able leaders realized much earlier that they had those among their team members, who were callow and unworthy. 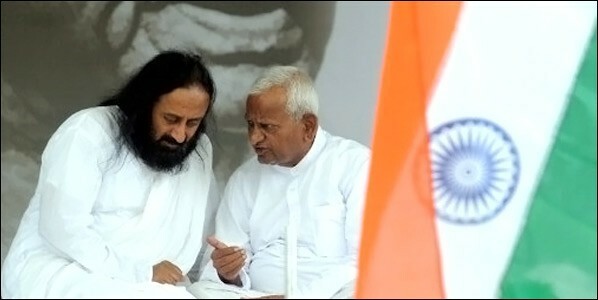 Sri Sri and Annaji at the IAC movement! 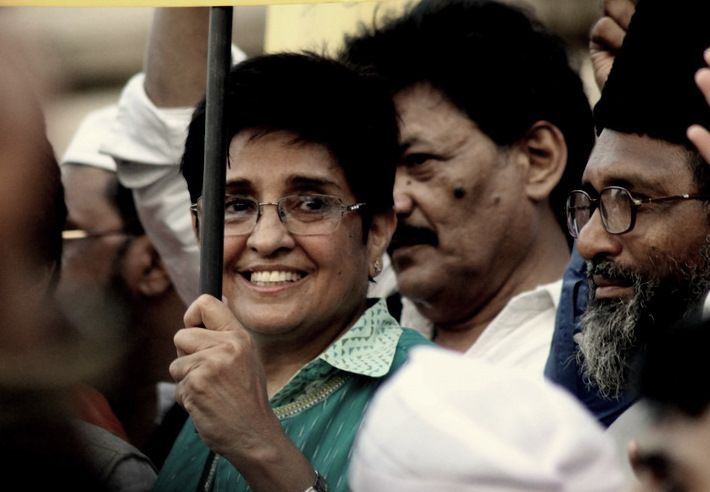 Kiran bedi at the IAC movement! Time alone could have proved that those who are victims of their own weaknesses, driven by greed for power, who could compromise their love and devotion for their country, were no role models .Arvind Kejriwal talked about fighting the corrupt to gather support from the Aam Aadmi (ordinary citizens) and when the testing time came to stand by his words, he gave into those very corrupt hands (against whom he campaigned) for the sake of being in power! Is a chief ministers position so ineffectual? Couldn’t he have atleast put a few corrupt leaders behind the bar staying there? Was Rome built in a day, then can the deep rooted corruption in Indian political system end in a day? Did he reach out to the Aam Aadmi, to consult and take advice before quitting? Was his decision to quit powered by lust to gain more political power? Bitter answers to some of these questions in future will prove if his love for the Aam Aadmi was driven by convenience or commitment, isn’t it! Making noise is not enough! It’s when one goes through the tests of time and proves one’s ideologies by complementing actions that his/her character outshines that of ordinary mortals. It feels evident to me today, that Arvind Kejriwal and his party members are continuing to take advantage of the innocence of my countrymen to fulfil their political ambitions, while we are failing to see any further than his hollow words. My heart aches to see such games being played. And the innocent being disillusioned by the pomp and show of his ‘fake idealism’. Is our country so cheap and are we so naive that we will let them rob our country and bring it down to docks. Like they left Delhi in the middle of nowhere?? Can ‘you’ and ‘I’ be sure that he will not join hands with the corrupt again and compromise ideals for being in power tomorrow? Can we really trust them to govern our country which faces terrible threats from looters inside and outside, when they failed to deliver their promises just yesterday? Wont their amateur and childish hands need much more skill and experience to nurture our wounded motherland?Why are they in such hurry to grab power? Can we afford to take a chance and hand over the greatest responsibility of protecting our borders in such hurry? Of course we can’t . They owe it to us to prove themselves first. Before coming and asking us for votes. Actions speak louder than words. Until they do not prove with their committed actions, we shall wait and they shall wait too. 2019 is only 5years away, will be happy to stand by them another day if they pass the tests of time. I will be glad if they proved me wrong in future and gained my trust back and also that of my fellow citizens. For now, we shall go with the lesser evil, with an expert who has experienced hands and his actions have written larger volumes of achievements than any of them out there. I will choose actions and experience over words. As my mother land is grappling for every breath and I cannot trust the newborns to breathe life back in her, who are falling and failing to deliver at every step. So that I won’t need to regret another day, I shall vote wisely. Let the truth triumph! 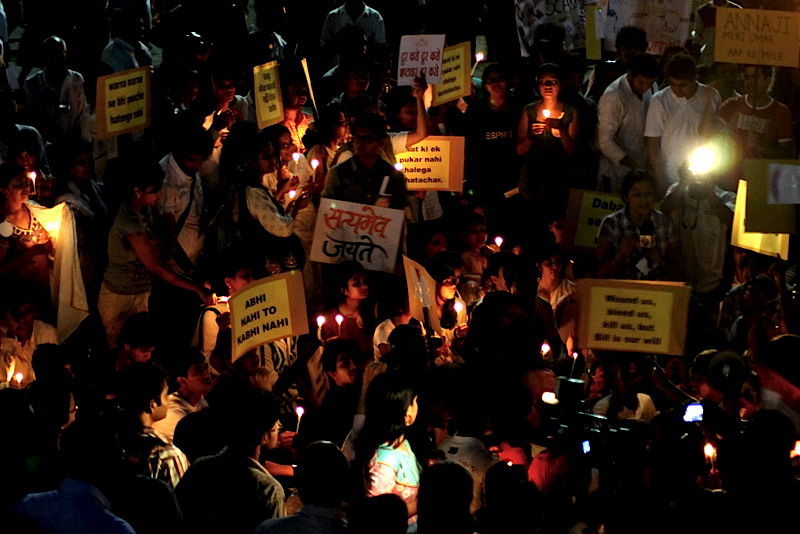 Satyamev Jayate ! This entry was tagged country, IAC movement, india, voting. Bookmark the permalink. Brilliantly written piece Di, True they are new comers and need to prove themselves. Democracy is different than populism and this has to be known by them. 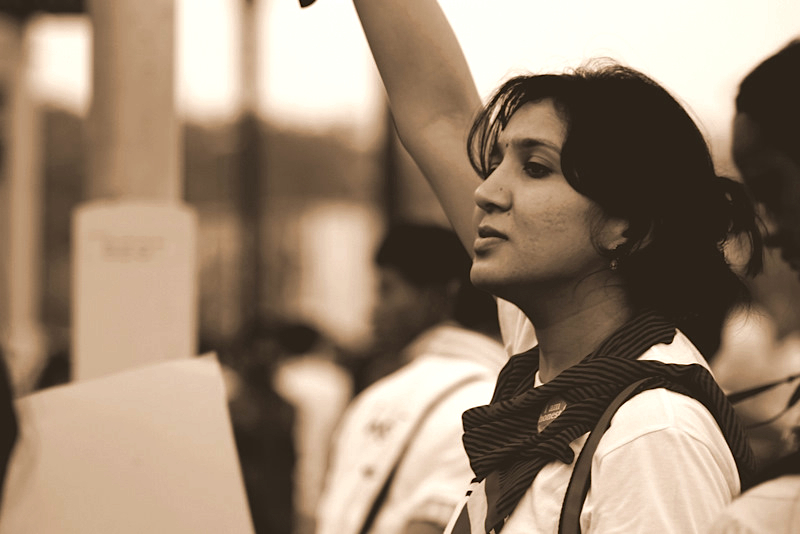 Street Politics cannot be the new form of politics on which the country will rely. Our Institutions no doubt need to revive but they need not be replaced. Our strong foundations of democracy have to be through these institutions of governance and not by rejecting them. Need to vote widely and wisely! This is very well written. Where you and me can see what the reality is, i hope through this post people who have not yet understood that have a realization too. Soo true janki! I hope this realization reaches to many many more people! Thats a brilliant stroke direct from heart. You have voiced many people’s thoughts. I hope that people see the other side of hasty run in politics and take a wise decision. I vote for a change. But definitely for an experienced change. Satyamev Jayate! Yes Apurva. We need to reach this message to more and more people !